Sisters and co-founders of contemporary art and lifestyle brand, Oliver Gal have a long history of fighting breast cancer. 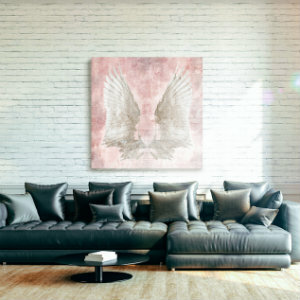 Now, in support of their cousin, Chie who was recently diagnosed, Oliver Gal created a custom art piece, Chie's Freedom Wings as a tribute to those who’ve lost their battle to breast cancer and to those who are fighting and inspiring others every day. During the month of October, 10% of proceeds of Chie's Freedom Wings will go to The Basser Center for BRCA, the first comprehensive center for the research, treatment, and prevention of BRCA-related cancers The price is $100.